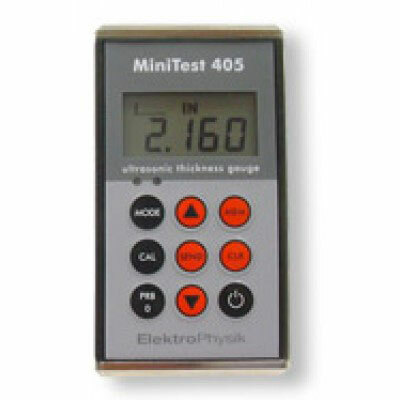 The MiniTest 405 is a straight forward ultrasonic thickness testing gauge with a built in data logger, housed in a all metal housing sealed with gaskets to make it weather proof and the sealed membrane keypad is impervious to moisture and oils. With the MiniTest 405 you also get the Difference Mode feature which is activated by entering a target value so then when readings are taken the unit will display + or – the difference from the target value. Alternatively you can utilize the Alarm Mode by entering a minimum acceptable value and as readings are taken if the measurement is below the acceptable value a red LED light will alert you that the value is below your acceptance value and a audible alarm will also sound. If the value is above your minimum acceptable value a green LED light will light. Custom Transducers are available up request. Factory calibration traceable to national standards. 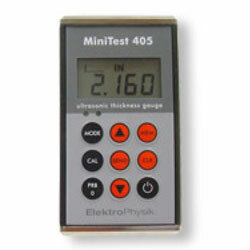 MiniTest 405 Ultrasonic Gauge, complete kit with T-102-2000 Transducer - Please contact us for pricing and availability.